Lord Steam dressed in antique Victorian clothes of the finest cut (and yes, he pulls it off, although he looks eccentric). He is a handsome tall man with long, Bryon-esque hair. He has an athletic, yet somewhat gangly frame. He usually carries his antique (and very valuable) brass tipped walking stick with him. Lord Steam is a genius. He grew up in Earth Victoriana London, to a wealthy and elderly father and a beautiful (disappeared without a trace) mother. He studied at Oxford studying engineering, and soon excelled. But his real love was detective work. Actually, his really real love was mingling in high society and dazzling everyone with his brilliance. After an indiscretion with Lord Bellowforth’s young wife, it was agreed by all that it was best that Lord Steam made himself absent. An excellent position on the newly discovered “Earth Independence” dimension had opened, and Lord Steam became an official ambassador to Earth Prime. Since his seemingly indefinite time in this dimension, Lord Steam has thoroughly enjoyed himself as a detective, man of leisure, and his very occasional demands as a diplomat, and is quite keen to remain in his advantageous and interesting position. Lord Steam is a restless and curious soul, unable to keep his nose out of trouble. Despite his intellect - and it is an intellect he uses - he is by nature somewhat reckless, a thrill seeker. One must also consider his upbringing - he believes in doing the right thing, in manners, politeness, law, and social order. In some ways, his aristocratic upbringing holds on to the code of "chivalry" from days past. He is no stick in the mud, however. He is also charismatic and charming, and loves throwing a good party and the company of equally charming women. He has a taste for all the fine expensive things in life, and only the best will do! Lord Steam has no super powers, but is a genius and extremely charming. He is a master of all forms of detective work and an expert in mechanical engineering. He has all manner of intriguing and useful gadgets; in particular a spiffy walking cane (full of concealed tricks), and a spring powered Grapple-hook gun (The latter is of course not something one would bring to a dinner party normally). If in a fight (which he prefers to avoid, as it hurts), he is a capable martial artist, trained in the EV Japanese/British hybrid martial art of Bartitsu. Antiquated Attitude: Lord Steam is somewhat antiquated in his view on servants, class, and even (in some regards) women, although always polite about it. (He has no prejudice on race or sexual orientation, and is actually very familiar with Asian cultures). Curiosity killed the Cat: The finest mind means the finest curiosity. Poking his nose in, and never letting go till the mystery is unravelled! Silver Spoon: Lord Steam can live without the necessities of life, but he simply must have the luxuries. He might refuse to use “common” things (public transport, cheap meals, cheap tools, etc). Equally, if a particular antique (or something artistic / splendid) captures his eye, he simply must have it! Steampunk Mechanic: Whilst clever with steampunk technology, modern stuff can sometimes defeat Lord Steam (particularly computers or electronics, but potentially some mechanical or structural work too). *Grounds increase size to gargantuan for the purposes of gardens, estates, etc (used in 3E), Stables function as a garage for horses etc. Charles Blakely looks like a mature man who is still in fair shape, and has a refined air about him. There are is faint vestigial military manner to him. Charles Blakely grew up in a military family and, like his brother, signed up as a young man. His career ended with a Zulu spear to the knee. He had an Indian wife (now deceased), and had a young son, and needed gainful employment. Fortunately, he was a hard working, experienced man and found gainful employment with Lord Steam. Charles Blakely is an astute man, but measured, polite and diplomatic. He has a slight snobbery towards rapscallions and riff raff. He has a desire to see the world. 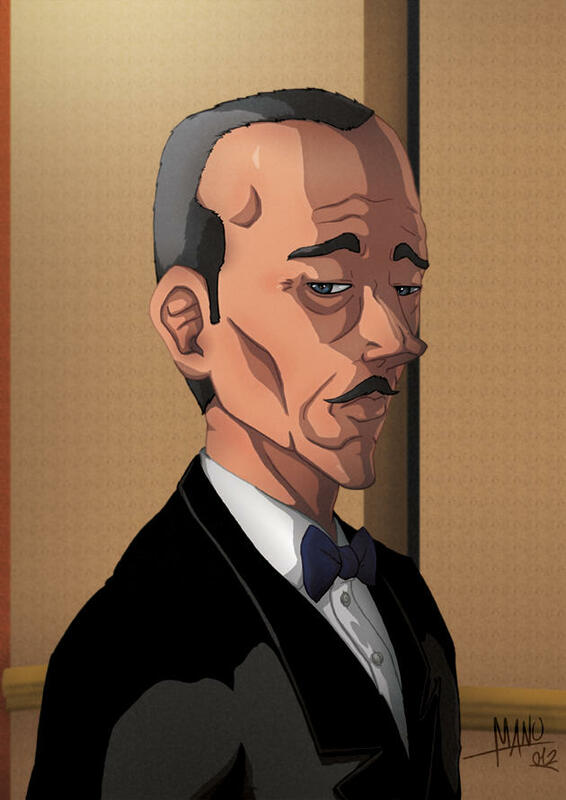 Charles Blakely has no powers but is a very skilled butler. He has many skills that compliment this role, and also has a background as an accomplished rifleman doing tours in Africa and India. He does not enjoy violence, however. If pressed, he has his war memento, an ancient antique bolt-action rifle. His main function is as an aide, and, at times, he steps in as official diplomat. Notes: To replace preexisting sheet as large update. Blakely is unchanged bar a change in type of Favoured Opponent. With 22 Charisma, Lord Steam would have a +6 Charisma bonus. Your Favored Opponent feat will not provide a damage bonus for you. I imagine you already knew, but as sheet reviewer I do have to point that out. Just in case. Skill Mastery gives you four skills per rank - with 8 skills mastered, Lord Steam would have Skill Mastery 2, not Skill Mastery 8. I believe the actual pp spent is correct, though. For my own visualization, how does the Multiple Weapon aspect of the cane work? If someone disarms the cane itself, how are powers retained? Is the mace spray separate from the cane itself, for instance? The Powers bit appears to have fallen off the end of the pp total, though I believe the final tally is still correct.